But Dave (or D-Kup to his friends) is admired by his peers and appreciated by his patrons, and also sports a resume featuring cocktail-serious joints such as the Tar Pit and Comme Ca. He tries to downplay what he does at the Eveleigh with admissions like, “I don’t feel like I do anything very innovative or special. I’m going to use what’s in season, what’s fresh and what’s good and then I’m going to use that to tweak a classic cocktail.” But he makes one of the meanest Mint Juleps in the city and can turn a cocktail into an everlasting gobstopper of flavors by layering just four ingredients. Needless to say the fact that he has made this bar, on clubby Redbull-and-vodka row in West Hollywood, the destination for cocktail geeks and industry folk speaks volumes. 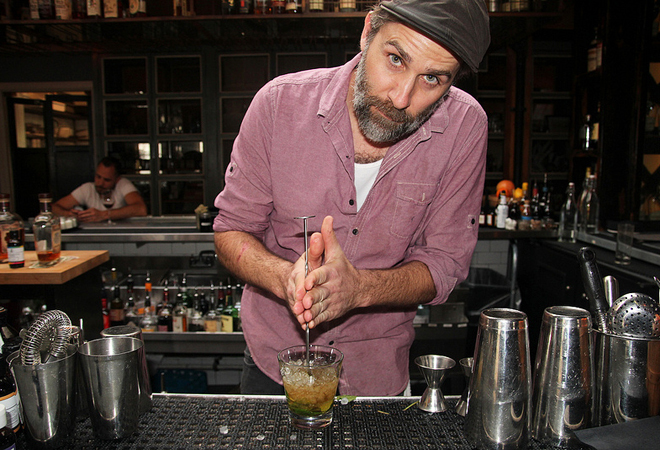 We asked him some quick questions, as part of our recurring Q&A series with L.A. bartenders. Here are his very quick answers. Blood orange Negroni on draught. Wednesday or Thursday, we have nice crowds but it’s not overly crowded like Friday or Saturday. So we can give guests a little extra attention. I’m not sure, I’m still trying to read all the old books. I’m an awesome beat boxer. I like to drink at Goldie’s or Cana Rum Bar. I like to eat at the Tasting Kitchen. When I’m off and out I like to drink scotch, mezcal or aperitivo style cocktails. At home I like to drink beer. The Eveleigh: 8752 Sunset Blvd., West Hollywood, 424-239-1630.